Red Pepper Quilts: Exclusive Alice Caroline Liberty of London Collection ~ A Giveaway! Exclusive Alice Caroline Liberty of London Collection ~ A Giveaway! Alice Caroline specializes in selecting fabrics from the main Liberty of London collection, the world's most desirable fabrics with a unique heritage dating back over 100 years, and putting the right designs and colors together to form their own unique brand. Fabrics are packaged together or sold individually by the yard to give customers a wonderful choice of colors for their sewing projects. Alice Caroline is delighted to announce the launch of their brand new and exclusive Liberty collection of fabrics. The collection has been designed in collaboration with the Liberty design team. Alice has chosen her favourite prints and created a collection of gorgeous new colorways which are now available exclusively from the Alice Caroline website. 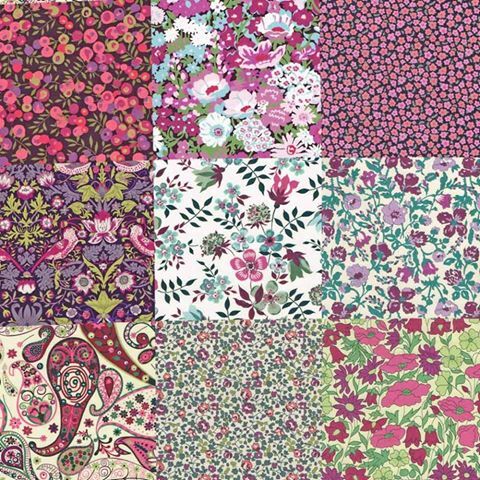 There are 16 stunning Liberty prints in the Alice Caroline Exclusive Collection. These include brand new colorways of the popular Betsy, Mitsi, Poppy and Daisy prints as well as some very exciting printed patchworks which have never been seen before! The two printed patchworks are especially exciting as these are brand new for both Liberty and Alice Caroline. In one of the patchwork prints Alice has revived her favourite purples in this stunning collection of much loved and vintage prints (pictured above). The second patchwork print brings together the beautiful Alice Caroline exclusive prints in some stunning tones and colours (pictured below). Both these patchwork prints are perfect as a cheater print for quilt making, and better still for when you need a variety of small fabric pieces - for applique or English paper piecing! 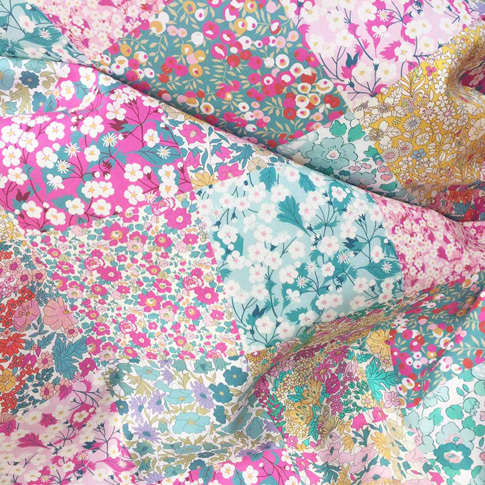 Alice Caroline - Exclusive Liberty Patchwork Print. 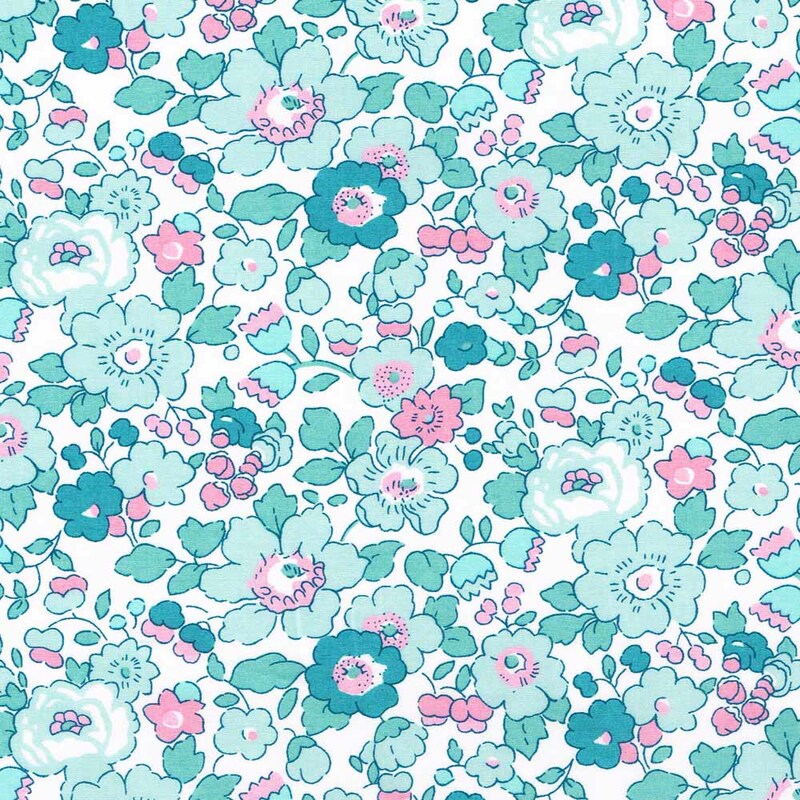 The Alice Caroline Liberty of London collection is shipping now! Alice Caroline is based in the UK and ships internationally. When clicking over to take a peek at the exclusive collection you may also like to check out the new Classics collection that has just arrived: New Liberty of London Classics. 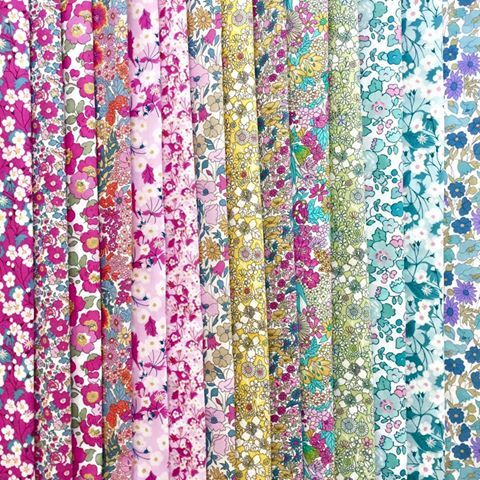 Alice and the team at Alice Caroline are giving away a fat eighth bundle of the exclusive Alice Caroline Liberty Tana Lawn collection (14 fat eighths) to one lucky RPQ reader. If I had to choose a favorite this would be it! The draw will take place at 2pm (Australia EDT) on Saturday 18 February 2017, at which time comments to this post will be closed. The winners will be announced by edit to this blog post, and will also be contacted by email. Congratulations Kate! Kate has been contacted by email. Thank you to Alice and the team at Alice Caroline for this giveaway and thank you for supporting my sponsors. COPYRIGHT and DISCLOSURE: Do not copy or use any content or photos from my blog without my written permission. Alice Caroline logos and fabric photos provided by Alice Caroline and used with permission. This is original content from www.redpepperquilts.com.